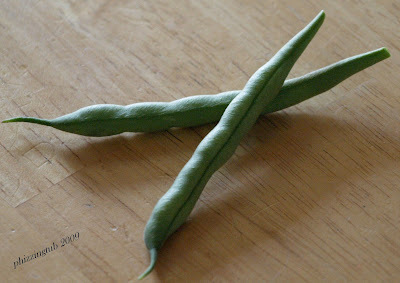 The Phizzing Tub...: We have green beans! The first green beans of the season! These were pulled off of a plant that some how managed to be planted in with my geraniums on our patio. I did not have the heart to uproot the plant and move it to the garden. We have a quiet a bit more in our garden that I will be collecting later today and having with dinner tonight. To me, there is nothing like summer fresh veggies from the garden.